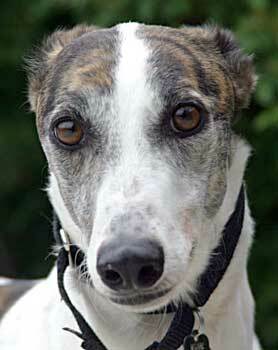 Dazey, aka Dazed, is a 4-year-old female, born August 16, 2003. Her dam is Fusion and her sire is Digicom. Her racing career started at Valley Race Park in Harlingen, then off she raced to Wisconsin and Florida. This beautiful girl is glad to be back in Texas and hoping to find her forever home soon. Dazey is not cat tolerant but has not been tested with small dogs. What a difference a couple of weeks makes. When Dazey came to our home, she was shy, withdrawn and afraid of my husband. With just a little patience, she's bloomed into a sweet and friendly girl around the house. She fits in very well with our three big boys and noses right in between them to get her spoon of peanut butter every night. She now freely (and frequently) approaches both of us for affection, something she wouldn't do at first. Her comfort level does not always extend outside of our home (Meet & Greets or big outings are not her favorite function and she doesn't do very well at either), but we hope that will improve. 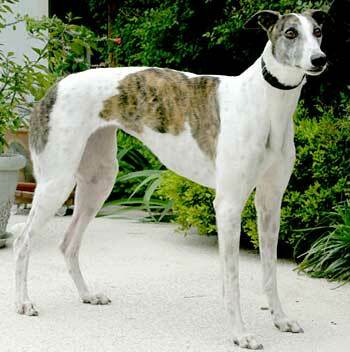 It's not a favorite venue for many of the greys, so she's not unusual in that regard. Dazey does love her walks and is excellent on leash. Unlike "the boys", she's focused on walking and doesn't lollygag around sniffing bushes or watering mailboxes - she just trots along, watchful for squirrels. Other dogs we've encountered don?t interest her at all. She lived with a cat for awhile but as her comfort level increased, so did her interest in the cat, so that's why she came to our home. Dazey is a real collector of toys and she always has one near her. She doesn't abuse or tear them apart, just loves to squeak and tote them around. Every night toys are gathered up and put back into the basket, only to be redistributed around the house the next day. Gotta keep 'em handy! Dazey has beautiful markings, liquid brown eyes and the softest coat. She lets us Dremel her toenails and even brush her teeth with an electric toothbrush. She doesn't like dog doors, we know that from her history. We've learned she doesn't crate but haven't had the need for it. She's been a perfect lady in the house, no accidents and nothing chewed up. Dazey would be best suited to a home with no small children and would be happiest with another dog(s) to keep her company, or in a home where she's a single dog and her "peeps" can give her lots of attention. It's been a delight to see Dazey come out of her shell. She won't ever be the outgoing poster girl for greyhounds because she'll always be a bit shy around strangers; but around her family, she's a sweet and gentle girl who will work her way right into your heart.